Many artists have entered the annual international ArtPrize competition in Grand Rapids, Michigan, but very few have lived inside their entries. Yet that’s exactly what Cleveland-based artist Loren Naji did with his competition entry, EMOH (“home” spelled backwards). 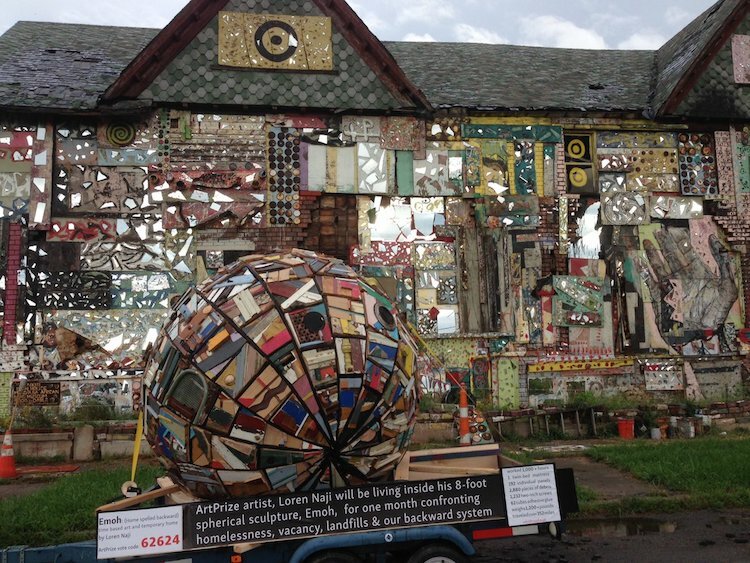 A spherical sculpture and temporary living space made of found objects, garbage, and remnants of abandoned or demolished Ohio and Michigan homes, EMOH garnered a great deal of attention at ArtPrize—resulting in an Emmy award-winning video created by USA Today. During the course of ArtPrize, Naji lived inside EMOH on the streets of Grand Rapids. Along the way, he developed relationships with the local homeless population and was invited to speak at several local shelters. He’s planning to do the same throughout 2018 in other U.S. cities with large homeless populations, including Pittsburgh, Boston, Denver, San Francisco, and Los Angeles—starting in New York in March during the Independent Air Fair. Because EMOH is such a conversation starter, Naji says it quickly becomes a curiosity, sparking interactions between all walks of life and starting public dialogue about relevant local issues. Naji was initially inspired to create EMOH by dichotomies he saw unfolding here in Ohio. In particular, he noticed the many vacant houses in Cleveland that are left abandoned and unused. With his sculptures, or “spherical canvases,” as he sometimes calls them, he aims to interrogate this juxtaposition of excess, need, and emptiness, noting how issues such as building codes, poverty, and accessibility often prevent homeless individuals from using even the available resources in a given city. As Naji considered this problem, it occurred to him that to carry out his full vision for EMOH, he would have to live in it himself. 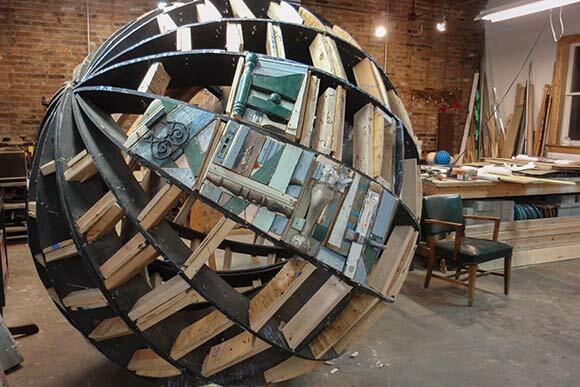 After covering the eight-foot-diameter sphere with panels of worn wood and “found paintings” that he had recovered from demolition sites, he set about making its interior into a homey atmosphere. “At first I thought this might diminish the artistic value of the piece,” he admits, “but it soon became the most important part of it.” He built a platform inside EMOH, fitted it with a twin-sized mattress, and added a bookshelf, nightstand, windows (complete with curtains), and even a “Home Sweet Home” sign. EMOH’s spherical shape is a nod to the Earth, which, as Naji points out, is also our home and should be our first priority. “The universe is made of spheres—of planets and suns and stars,” Naji says. Alongside the national tour, Naji plans to implement programs here in Cleveland that would address the widespread housing problem while bringing more public art to our streets. He hopes to use the original EMOH as a template for others that could be designed and painted by local artists. He also plans to work with local governmental agencies and non-profits to equip them with hatched doors, solar panels, insulation, and sleeping spaces so that they can serve as temporary housing in some capacity. He envisions that at least 50 homeless individuals could use the sleep spaces, and that the program could bring more awareness to issues of poverty and homelessness in Cleveland.